Nationalism itself is an historical phenomenon. Historical phenomena have nothing to do with “capital-H” History in the sense of a grand purpose. Instead, they belong to the aimless and contingent movement of actual history. In its meandering course, some of our unpredictably mutating symbolic constructions fulfill circumstantial needs arising within the existing cultural environment and become, as sociologists say, institutionalized. Nationalism is one such symbolic construction, which became institutionalized in the plethora of social arrangements that we recognize as modern society. The accident that created the need which nationalism fulfilled appeared during the quarrel between the branches of the English royal family in the second half of the fifteenth century—the Wars of the Roses. The conflict was protracted, but it is enough to mention that, by the time it ended in 1485, both branches lost all their males, and the English feudal aristocracy was physically destroyed. A very distant relation of the Lancaster branch took the throne as the Tudor king Henry VII. In need of an upper class, he soon recruited a new aristocracy from the common people. This situation was unique and made no sense within the cultural framework of the prevailing feudal society, which was organized as a “society of orders,” to use the proper historical term. The society of orders was based on beliefs as entrenched in its institutions and in the minds of its members as our beliefs are entrenched in our institutions and in our minds. This society’s foundational belief was that the feudal social structure was an emanation of divine authority; by God’s will the society was divided into three orders of human beings, unequal in their rights, their duties, and, in many respects, their very nature. The blood of these orders did not mix; whatever the evidence to the contrary, some even believed it to be of different colors. One order, that of the clergy, was celibate and by definition could not contribute to the regeneration of the stratification system. But the upper (“blue-blooded”) order of the military nobility and the huge lower (“red-blooded”) order of the people, to which the overwhelming majority of the population belonged, were in effect believed to constitute two separate species of being. They were different as horses and chickens are different: one could no more be born a nobleman and end up—or produce—a commoner, or vice versa, than one could be born a chicken and grow to be—or produce—a horse, or vice versa. The lives of members of different orders naturally had different value; noblemen and the people were supposed to be treated differently and expected different treatment. They lived completely different lives, spoke different languages, and had different identities. To suggest that a French nobleman, for instance, belonged to the French people would be a profound offense, an attack on the dignity of the nobility. Unless interpreted as sheer nonsense, it could justify a challenge to a duel. In other words, identities within the society of orders were exclusive, and the governing social principle was the principle of inequality: the godly society—and therefore, the just society, since God could not be accused of injustice—was an inegalitarian society, a community of fundamentally unequal members. Such a society, obviously, did not countenance social mobility, which was neither legitimate nor conceivable. One had to stay put, socially speaking, where one was born. But in early Tudor England social mobility was a highly visible fact. This fact, incontrovertible particularly to those many red-blooded commoners who now occupied aristocratic positions—positions which, according to their own beliefs, they could not occupy—demanded an explanation. Nationalism was the answer to this demand. It resulted from a linguistic-semantic innovation: the equation of two terms that had previously belonged to two unconnected semantic fields: people and nation. The specific meaning of the word “people,” as discussed above, was “commoners,” the lower classes. The word “nation,” meanwhile, meant an elite, representatives of cultural and political authority. In the fifteenth century, the word nation was used in the context of the Church councils, where “nations” designated communities of opinion regarding relationships between the papacy and other powers of the respublica christiana. We shall never know whose idea it was to make the two words, people and nation, synonyms; the fact is that someone in England had this idea very early in the sixteenth century, and it was immediately accepted within the ever-widening circles of upwardly mobile commoners. Redefined as the English nation, the English people was elevated to the dignity of the elite and became the bearer of cultural and political authority—its members interchangeable, each equally able to occupy the loftiest positions. As a result, the dominant view of social and political reality changed dramatically: the world was now believed to consist not of patrimonies of princely lineages, but of peoples—which were nations. A nation was a sovereign community of fundamentally equal members and inclusive identity, which cut across lines of class and status. The emergence of this new national image of reality—national consciousness or nationalism—in sixteenth-century England inaugurated the age of continuous social change oriented toward the realization of the principles of popular sovereignty, fundamental equality of national membership, and inclusive identity implicit in nationalism. These principles are best known to us under the name given to them by the French Revolution of 1789, which signaled the arrival of nationalism in France: liberty, equality, fraternity. Thus nationalism brought into being modern democracy, which is precisely the institutionalization of these principles. Commentators in the Western world, who today bewail nationalism as a threat to democracy—unaware of the identity between the two—are incapable of understanding either. And they are unaware of this identity because they substitute ideology for history. Today’s confrontations are not confrontations between nationalism and democracy; they are confrontations within nationalism and democracy. While nationalism everywhere implies popular sovereignty and fundamental equality of membership (hence democracy), societies constructed on this basis—or existing within a national framework—differ as much as feudal societies differed within the Christian framework of the society of orders. The very same principles can be interpreted and implemented differently. This means that while all nations are by definition democratic, the democracies they develop into are likely to differ in accordance with the type of nationalism within them. In England, it was the individual experience of talented, upwardly mobile commoners that created the need for a new vision of reality, which nationalism fulfilled. English nationalism, therefore, emphasized the individual, deriving the nature of society from (a presumed) human nature. The nation and the people were defined as associations of individuals. This was reflected in the English language of the time, and throughout the eighteenth century, in which both the words “nation” and “people” were collective nouns, employed with the corresponding pronouns “we” and “they.” It was because freedom and equality were supposed to be human needs that social justice was equated with freedom and equality. And it is because our American nationalism is, in effect, a transplantation of the original, individualistic English one that we still believe that this is so. The type of democracy in which individualistic nationalism is institutionalized is liberal democracy, characterized by institutions which first and foremost safeguard individual liberties. The redefinition of the general population as an elite made national identity a dignified identity, separating it sharply from the great majority of identities that had preceded the age of nationalism. Now everyone belonging to a national community enjoyed dignity, whereas, before nationalism, such dignity was known only to tiny minorities—those belonging to the narrow upper strata. It is this implication of dignified identity that has been responsible for the worldwide appeal of nationalism, and which explains the eventual globalization of national consciousness. What drew the attention of people outside the sphere of England’s direct influence to nationalism, however, were the experiences of established elites whose status was threatened, making them protective of the dignity they had already enjoyed. Paradigmatically, this was the experience of the French aristocracy under the onslaught of royal absolutism. In the eighteenth century, England emerged as the model for France, chiefly because the English aristocracy (of recent origin, which its French admirers disregarded) was doing so well vis-à-vis the monarchy. This was related to the fact that England’s elite represented the nation, the chief object of its loyalty. The frustrated elite in France decided that France needed nationalism too. But, they thought, what made the French people a nation was that it was separate from other peoples—it had distinct traditions, a unique language, and so forth. For the French, the nation was not, as it was in England, defined by its inner constitution as a sovereign community of fundamentally equal, individual members. In France and similar cases, freedom and equality were an implication of nationhood, not its basis. As a result of such importation of national consciousness, collectivistic nationalisms developed, with the nation and the people defined as collective agents. These collective historical agents would be perceived as largely independent of the human individuals who in fact composed them. They were assumed to have their own interests and will that could not be gauged simply from the interests and will of the majority of constituent individuals. As a result, collectivistic nationalisms naturally tend to produce authoritarian, rather than liberal, democracies, because someone must divine the will and interests of the nation and dictate them to the populace. (The paradigmatic example of such an authoritarian democracy, the Jacobin dictatorship, is offered, again, by France.) Cultural elites everywhere arrogate to themselves this role of interpreting the national will and interests. By right of their superior education they assume the position of a natural aristocracy and look down on the less educated majority, especially if the latter refuses to follow their instructions as to how the national community in its entirety should live. Today, when such disagreements between cultural elites and the less educated majority arise, the voice of the majority is referred to as “nationalism,” often also called “populism,” while the nationalism of the elites is seen (by these elites) as the voice of universal reason or History with a capital “H.” In the early days of nationalism, however, when there were no regular channels (such as voting) for the expression of the will of the less educated, the cultural elites—the intelligentsia—were the spokesmen of nationalism and populism, “populism” being just another word for nationalism. Collectivistic nationalisms can be of two types, civic or ethnic. Which type arises depends upon whether national membership is perceived as a voluntary commitment to the national culture (language, political and economic values, etc.) or as a matter of biological heredity, independent of individual volition. In turn, such different definitions of nationality depend on the level of cultural achievement of the national community at the time of its formation (i.e., when it is defined as a nation and when its national consciousness takes shape). A distinguished record of secular achievement endows the national culture with dignity capital, making it an object of pride for its members, and contributing to the dignity of personal identity already implied in the equation of the “people” with the national elite. A nation with a large amount of dignity capital attracts members; people actually want to belong to it. This is civic nationalism. But civic nationalisms are not always individualistic. A civic nationalism that defines a nation as a collective agent inevitably implies the circumscription or even denial of individual choice. This makes collectivistic and civic nationalisms inherently ambivalent and conflicted. The classical example of a collectivistic and civic nationalism is French nationalism. Civic criteria of national membership have made France, which is not a nation of immigrants, remarkably open to immigration from the outset. Anyone who wanted to be French (i.e., was willing to commit oneself to its defining values) has been welcome. In France, race has not posed the same problem as it has in the United States, while religion has been excluded from the public sphere by law, making it a private matter. This is not to say that the French national record has been faultless in realizing the ideals of equality and fraternity. The most common and egregious example of a betrayal of these ideals, anti-Semitism—the exclusion of Jews, whose commitment to France was unreserved—has reared its head time and time again. Although the national French identity dramatically diminished the influence of pre-national anti-Semitism, it did not wipe it out completely. In contrast, it is wrong to paint today’s opposition to indiscriminate immigration from Muslim countries (of the Rassemblement National and the significant sector of the French population voting for it) with the same brush. The motivation behind this opposition, broadly speaking, is neither the dislike of Muslims as such, nor general xenophobia. Rather, it is a rational reluctance of Frenchmen committed to the French nation, irrespective of religion, to welcome into their midst large numbers of newcomers who openly refuse to commit themselves to its preservation. For those confused about the nature of nationalism and democracy, or who find the clearly democratic nationalism of the Rassemblement National difficult to grasp, the independence movement in Catalonia may offer a better and easier-to-understand example of collectivistic and civic nationalism. Integrated in the possessions of the Spanish Crown through marriage alliances, Catalonia is a province with its own language and a long and distinguished cultural record. In recent centuries it achieved greater economic development and is still more productive and prosperous than other areas in Spain. For these reasons, it was in Catalonia that Spanish nationalism was likely born, because national consciousness there could appeal to the urban bourgeoisie and intelligentsia, classes that were only embryonic elsewhere in the country. In poorer regions of Spain, the aristocracy (unlike in France) was apparently satisfied with traditional ways of thinking. As long as this was the case, nationalism, which implied popular sovereignty and fundamental equality between traditional upper classes and the vast majority of common people, would make very little sense to the former. It is possible that the conflict between Barcelona and Madrid originated in the fundamental misunderstanding between the carriers of the new, national, democratic consciousness and those who still saw reality through the aristocratic-religious lens of the society of orders, rather than as the opposition between Catalan and Spanish nationalisms. But the latter eventually became the principal conflict, after the fascist regime failed to forcibly impose a uniform Spanish nationalism on the entire country. During this attempt, expressions of particularism that could stand in the way of national unity, such as the Catalan language, were suppressed. Barcelona was the center of the opposition to Spanish fascism, and today many within the Catalan intelligentsia identify the fight against fascism with the fight for Catalan independence. As a result, they perceive Catalan nationalism as anti-fascist in its very essence. They perceive themselves, that is, as the vanguard of European democracy. Thus they do not understand why they get no support from the European Union; why declared European (and American) anti-fascists do not sympathize with them; and they refuse to see any similarities between themselves and other nationalists, with the exception of the Scottish, around them. After all, they argue, they welcome immigrants of whatever color and creed, if they are willing to speak Catalan and respect the Catalan way of life—if, in other words, they wish to become members of the Catalan nation. But so do the supporters of Brexit in Britain and of the Rassemblement National in France, and most so-called nationalists in the United States. Above all, they all wish to be recognized—that is, given the respect due to their nations because of these nations’ record of cultural achievement, economic prowess, and devotion to the values they consider universal. So, the Catalan intelligentsia is out of step with other Western cultural elites, who today equate nationalism in the midst of “developed democracies” with fascism. These cultural elites identify fascism, in turn, not with the particular historical regimes in Italy and Spain, but with racism, exemplified above all by German National Socialism. They ascribe to nationalism of whatever stripe characteristics of Nazism, which civic nationalisms, respectful of individual choices, by definition defy. German nationalism, which eventually took the form of National Socialism, was a collectivistic nationalism, but it belonged to the collectivistic and ethnic type of nationalism. In the framework of ethnic nationalism, membership in the nation is a matter of blood, which can neither be acquired if one is not born into it, nor lost if one is; in other words, nationality is race. This type of nationalism, which is fundamentally racism (sometimes called ethnic chauvinism), is the form in which racism has appeared in the modern era, and it develops when the envisioned national community has a relatively poor record of cultural achievement. By the time German nationalism began to develop, the German cultural record was—disturbingly for the nationalists—rather undistinguished. Secular literature in German—drama, poetry, philosophy, science—barely appeared before the late eighteenth century. 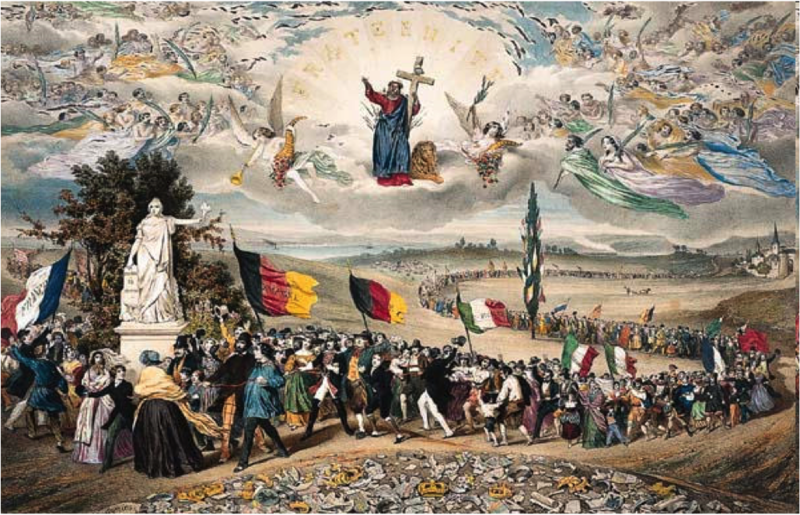 This was the reason why German nationalism pointed to the intangibles of blood and soil as the proof of German virtues and stressed the superficiality of visible achievement in France, Britain, and especially among the Jews. (This was also the reason for the insistence of Nazi ideologists in the twentieth century, despite it being contrary to all evidence, that German culture dated back fifteen hundred years.) This cultural underachievement of the community is recognized by the very members of the elite who import nationalism, leading to the development of a sense of inferiority among them, which becomes a central ingredient of the national consciousness. This sense of inferiority results in the specific psychological dynamics of existential envy (ressentiment), which in turn makes the nation that is formed very aggressive—always feeling threatened in its dignity, and eager to blame outsiders, whose superior achievements its spokesmen envy, for its woes. This anti-Western stance assured Arab nationalists the consistent support of the Soviet Union. Many of the Arab leaders (from Nasser to Arafat) had close ties to Moscow, and some (e.g., Mahmoud Abbas) were educated there. They shared the atheistic, Marxist creed of their patrons. After the USSR collapsed and Russia abandoned its Communist beliefs, however, these secular leaders quite suddenly turned to fundamentalist Islam—some of them returning to their faith and others, it appears, discovering it for the first time. In fact, the great religion of Islam represented for secular nationalists the only source of dignity capital on which they could lay claim to the respect of the world for the Arab nation. Relative to Western societies, which Arab elites saw as the standard for comparison, their own societies appeared hopelessly backward. They therefore turned Islam into the central national characteristic. Thus Islam’s role in recent years has been functionally equivalent to the one played by anti-colonialism, anti-imperialism, and Marxist or socialist opposition to the West during earlier phases in the development of Arab nationalism. Opposition to the West also diminished the sense of inferiority (indignity) among nationalists, whose own history offered little record of visible achievement of which they could be proud. In the absence of other forms of achievement, Islam allowed them to find dignity in their moral and political present. Previously, Arab nationalists thought their opposition to Western colonialism would place them on the right side of History. But it proved to be the losing side, leaving nationalists no other recourse but to return to their distinguished ancestral religion. Although it was Germany that set the example for all the later collectivistic and ethnic nationalisms, the first such nationalism to emerge was the Russian one. A contemporary of the French and American nationalisms, already formed in the eighteenth century and thus one of the earliest in the world, it was the first nationalism based on a sense of inferiority towards the early national societies (to begin with England/Britain, then also France and the United States) from which the first generations of Russian nationalists imported the concept of the nation. At the end of the seventeenth century, Peter the Great, the all-powerful ruler of Russia (which only years before acquired its name and whose size, while already far greater than it originally had been, was nowhere near the vast expanse it possesses today), ordered the hapless upper echelon of his subjects to adopt Western societies as their model and emulate their ways of thinking and acting. This project included, above all, thinking and acting as members of a nation. Obedient as they were to the will of their tsar, the elite did so. National consciousness, however, made them deeply ashamed of Russia. Their chosen Western models were sovereign communities of fundamentally equal members with an inclusive identity. In contrast, Russia at the time was an autocracy where a tiny minority owned over 80 percent of the Russian people as slaves, and which had no record of secular cultural achievement, or even a language to record it. The indignity of being members of such a nation led, by the end of the eighteenth century, to ressentiment against the West. For their national identity to be dignified, Russian nationalists needed the respect of the West, yet they themselves knew that they could not be respected. Any comparison with the West—which was psychologically necessary for Russia’s elite—underscored Russia’s failings. And so their chosen models were transformed into anti-models, and all of Russia’s national existence since then has been defined by the attempt to prove (to itself as well as to whomever the leading Western power of the moment might be) that Russia was better or at least more powerful than the West. Therefore, undermining the dignity of the West by every means possible has been the constant goal of both the Russian state and the Russian cultural elite. Already in the eighteenth century, Russia had emerged as a colossal military power, feared by everyone around it. This military strength has been the main chip in the country’s power game in the international arena, regardless of the regime: the tsars, the Politburo, and the post-Soviet presidents have all used the military as a bludgeon, at times with great success. The Russian cultural elite, on the other hand, has mostly taken the route of moral superiority. Indeed, Russia was the first nation to use the ideology of social justice, specifically Marxism, to justify its claim to the leadership of humanity. It is thanks to Russia’s nationalists (of whom Lenin was not the least) that Marxism acquired its broad influence around the world and informed so many collectivistic/ethnic nationalisms in search of the dignity capital that was lacking in their native stores. The love-hate relationship between the political and cultural elites in Russia has often resulted in the adoption of “totalitarian” ideologies, initially articulated by the intelligentsia, before being adopted by the state; this situation obtained throughout the Soviet period. The moral megalomania of the cultural elite (the idea that they knew what was good for everyone, even when hardly anyone agreed with them) combined with the military might of the state to produce what some Western observers called Soviet totalitarianism. The Cold War, however, was no more a conflict between the abstractions of totalitarianism and liberty than World War II. Both were struggles of resentful collectivistic-ethnic nationalisms, based on a sense of inferiority toward, and envy of, the West (in Germany represented by the Jews). Such resentments could only be satisfied by the humiliation of the West. Therefore, to interpret the collapse of the Soviet Union as the decisive victory of the free world over totalitarianism was naïve and dangerous (as indeed the carnage that immediately followed the victory celebration proved). The Soviet Union’s defeat was in reality the failure of a colossal, resentful military power to achieve its nationalist goals by certain means. Thus it should have been obvious that, having licked its wounds, Russia would attempt to achieve the same goals by other means. No one could emerge from this victorious. The motives behind the conflicts challenging our civilization today—whether the unwillingness of Muslim immigrants to adopt the national customs of the countries which they want to be accepted in, or Russia’s muscle-flexing vis-à-vis the United States—remain exactly the same as those that drove the great wars, hot and cold, of the twentieth century. Neither Donald Trump, nor even Vladimir Putin, can be held responsible for them. The spark that ignites the mixture of inferiority, envy, and desire for recognition, which feeds ethnic nationalism, is being lit by the delusional thinking of Western elites. These elites, ignorant of and unwilling to learn from history, refuse to understand nationalism, disregard the psychological dynamics behind it, and continue to rationalize their existence via a belief in a History with a grand purpose. Such illusions allow a leading member of this elite, President Obama, to dismiss Russia’s invasion of a neighboring country as a trifle, bound to self-correct, because “that is not how international law and international norms are observed in the twenty-first century.” Meanwhile a whole choir lays the blame for the escalation of national tensions around the world at the feet of his successor. It may be fortunate that, very soon, the fantastical ideology of Western cultural elites will become irrelevant to world politics, as the West loses all power to regulate world affairs. Such power will pass from the hands of liberal democracies, divided against themselves and struggling, to the hands of a unified and self-confident China—thanks in part to the anti-Western stance of Western elites themselves. But, while elite ideological obsessions are certainly to be credited for the disorientation and implosion of the Western liberal order, the seemingly unstoppable rise of China to world hegemony has nothing to do with them. Its cause, instead, is nationalism. In the last three decades, nationalism has finally taken root within China’s giant population, animating this previously inert, enormous mass of humanity with competitive, nationalist motivation. For the first time in its long history, China demands from the world the dignity due to it, and insists on being recognized by all as the Middle Kingdom. China, however, is different from most other participants in this competition: it belongs to another civilization. Unlike Russia, unlike Arab countries, it has never seen the West as a model. It does not envy the West, and so, ultimately, could never consider itself inferior to it. Its identity is self-sufficient, and its internal dignity does not depend on the respect accorded by the West. For this reason, it can borrow from the West piecemeal, customizing its imports in the process. Neither freedom, nor—more importantly—equality, are of great value in China, where fraternity is possible in their absence, and dignity in its nationalism does not depend on the presumption that “all men are created equal.” The rise of nationalism in China is the central event of our time. With it we truly open a new page in history. 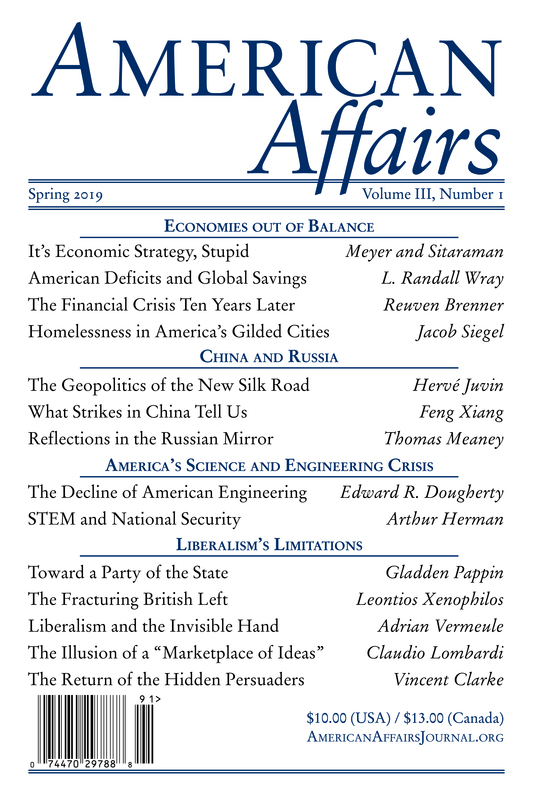 This article originally appeared in American Affairs Volume II, Number 4 (Winter 2018): 145–59. Liah Greenfeld is professor of sociology, political science, and anthropology at Boston University. She is the author of eleven books, including Nationalism: Five Roads to Modernity (Harvard University Press, 1992) and The Spirit of Capitalism: Nationalism and Economic Growth (Harvard University Press, 2001).